While at first, I was a heavy supporter, I've since changed my position. Pros: It's a very visually pleasing system that helps those with creative minds more easily organize their information. Cons: Their policies do not protect you from having your property taken. They have no recognition of 'root administrator' accounts, so if you add another administrator you are henceforth vulnerable indefinitely. Alas, the cons outweigh the pros as there are, perhaps less visually pleasing but still perfectly good products (free in a lot of cases) that do what this product does, allows you to retain more security, and has more features available. I'm rather disappointed as I hoped this would become the ultimate solution, but the team had a hard time figuring it out to start - were never motivated to use it just from a system standpoint. Overall: I've honestly had more problems than solutions when it comes to using monday, formerly known as dapulse. It was very visually pleasing, but that's as far as the benefits went. Pros: Monday really fails to stand out in any special way or to fulfill any special functions. It's best qualities, are standard to every project management collaboration program on the market. Cons: Monday lacks any type of notification function for overdue or pending tasks. The importing and exporting features - are really not truly features. Instead of adding value to the program, exporting data (csv file) to or from the program serves as a detriment and generally useless. The biggest sticking point for me - Monday requires users to purchase a premium packages in order to use # tags. How, that is not a standard feature in all PM software in this day in age, I will never understand. Cons: This tool was designed for micromanagement and abuse. My old manager made us use this for a while, and he'd use it to keep track of everything we did every day. It poisoned the team culture. Pros: The tasking feature is excellent. If using this primarily to complete a to do list the functions are really excellent and commendable. This works exceptionally well for our sales and marketing teams but not so well for our operational teams. We have large teams with very complex operations. Cons: When you are dealing with full project management the system has many key cons. We cannot use this software for our main project management because we need the ability to bring in our clients and/or vendors or offsite representatives to update this at will in a non complex manner. The issue is that each task must really on other tasks only sometimes. - The premium plans' pricing structure doesn't seem logical. Overall: I really wanted to love this software as I was a user of the product before the rebrand and reskin from DaPulse. It had potential, but their stupid pricing levels and feature layouts really turned me off. I communicated this frustration to the company and they blew it off like "sorry, that's just the way things are". I didn't get a sense that they are listening to their users. Pros: Oh everything is great about it. Works across all my platforms, iOS, Mac, PC, the works. Every feature is awesome and this seemed... SEEMED like the perfect tool to use. I upped my stars for this product just because I wrote them about this problem, and got a response back within about 2 minutes, explaining a workaround I can use if I don't wanna buy the pro version. To at least get my data. Cons: They tricked me into using it for personal organization. Which I did for 60 days. . I can't get into my personal board anymore, to get any of my appointments or documented projects I made for myself. Yep. They are holding it hostage with a cheap trick. So I am here, to tell you all about it. Pros: I loved the marketing videos and the website in general. It was the reason that I signed up for the free trial. The app itself is colorful and well-designed. Clearly, a lot of thought was put into the UX and UI. Cons: However, despite its cheerful appearance and design, the app never rose above its competitors. Anything that could be done at a steep price on monday.com could just as easily be done on Trello or Asana in my opinion. If monday.com was free, then it would be a personal choice, I suppose; at its price point, I found that it was simply not worth the investment. Overall: A nice product, but certainly overpriced and (slightly) overhyped. Pros: IT's a good way to visualize your workload, and your team. There are better tools though. Cons: Just didn't seem to be as user friendly as something like Asana. Overall: We tried to get on board with it but couldn't get it going. Switched back to Asana. Pros: The redesign of the software is very nice. It seemed relatively easy to use and to share with other teammates. Cons: The software didn't relate to any of the problems i actually needed to solve. It was a great interface, but too clunky or simple for the advanced tasks i needed it for. Overall: Overall good, but not a good solution for the organizational problems I was trying to solve. I have since found much better solutions out there for these tasks. Pros: It is kind of neat that you can add a timeline to individual phases to get more accountability out of your team. Cons: Paying for having a little timeline plugin which is what's essentially a calendar doesn't seem like something people should be paying for, and their marketing wayyyy over hypes their product. Relax you made a timeline, not a time machine. Pros: An interesting approach. But didn't work for us. Cons: Usually project teams will need something more flexible. Cons: I'm computer savvy and it was hard to figure out. 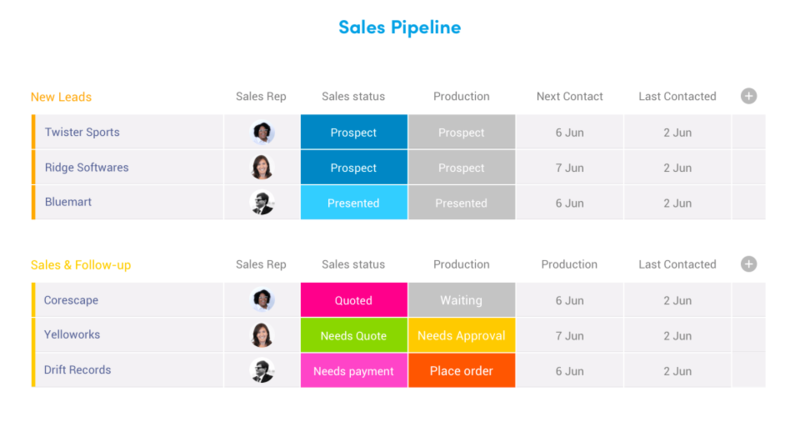 Pros: Visual, its very easy to visualise tasks and see what you and your team have on by ways of workload. Initiative, although it has many features, all are logically positioned within the webpage so you never find yourself being lost in menus. Customisable, the boards are completely yours to design, own and use. Changes can happen instantly and hassle free meaning things can adapt to the needs of the team. Support, when ever required, support has been readily avaliable and responsive. Bugs, although rare, have also been resolved quickly. 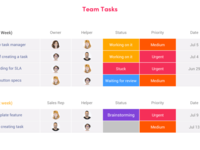 No subtasks, so many say sub tasks are a con, but sub tasks really cause issues and it's how to lose things, so a flat task structure hugely improves clarity. Live system, updates and task status update instantly for all users in real time. No "who has the task spreadsheet open?" anymore. General, this is a "to do list" which is Initiative and interactive which once properly implimented for your team will revolutionise work flow. Cons: Speed, as use increases and boards become larger, the interface is significantly slower. Promised improvements in speed have yet to be seen. Large boards, large boards are hard to mannage due to speed and bulk update/automatic date fields etc. Overall: Already covered in previous question in part. Empowering team to tackle tasks in an order which suits them within the bounds set. Improvement in productivity and customer response. The software is a solution to some of our problems, just maybe not the best solution. Pros: It is visual so it's easy to see where things are at with a quick glance. As a tool to help our company be more productive, it's nice to have software that does not slow you down navigating or understanding it. The format and readability of the site allows even our technologically challenged dinosaurs of the office to use this software with ease. useful features (private boards, selective sorting, etc) also adds to the cost with every addition. Monday is much more convenient to what we were doing before (whiteboards, spreadsheets, calendars) as everything is located in one place but our previous solution was free and this fix (that requires quite a bit of tweaking to hold our needs) comes with a monthly price tag. What it boils down to is this software is convenient but not necessary. I don't see it paying for itself with time or cost savings due to having better communication and more of our info located in one location. If it doesn't increase profit, is it worth it? So far my answer is no. Overall: Much more of our info readily available (even on jobsites thanks to the mobile app) and all on one platform. Plus the real time updating of information that can be seen throughout the team is a game changer. We love that you can tag tasks to an individual as well. 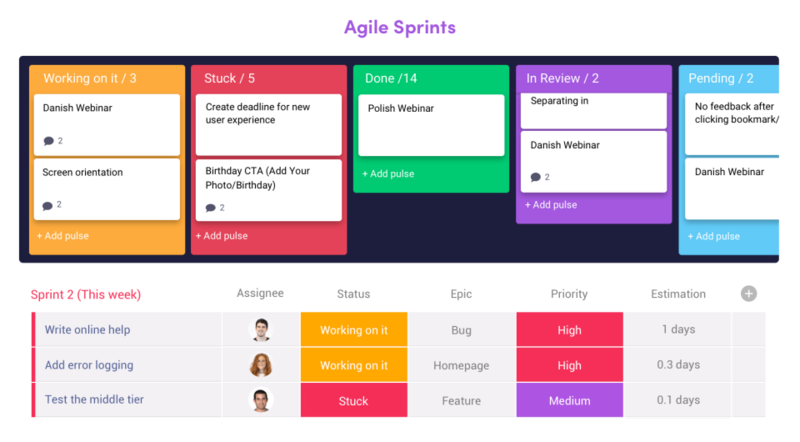 Pros: More modern, flexible way to track projects as a team v. sitting in front of spreadsheets and project plans all day that have to be emailed/made more presentable for executive leadership, which is a time sink. It serves a high level AND a low level purpose for true transparency across all levels. I love how configurable it is for OUR needs and terminology, and how easy it is to share and subscribe to updates. Cons: I am missing some key capabilities, like tracking which people are working on something and roughly how much of their time is being spent on it. For now, I'm just tracking who is leading. I also cannot track what skillsets are required, what systems are affected, etc. These needs are somewhat specific to our environment, but these details enable our decision-making at a high level. Even something as simple as creating our own custom tags for things and making those visible on the Board and filterable in reports would be one idea that other organizations might use too. Overall: I believe in working smarter not harder, and in my line of work (managing complex IT projects, typically software) traditional tools make that difficult, if not impossible, because I spend all of my time updating project plans that no one will ever look at. I appreciate the Dapulse way of simplifying project tracking so that my team spends more time working than tracking, and when they do need to track something, it takes less time and is more intuitive to do so. While there are a couple of key capabilities that I am missing and have to handle in other ways, such as Excel sheets, the majority of what I need is there already, and I am hopeful that Dapulse will continue to innovate and deliver their spin on things like resource allocation, effort estimation, what-if forecasting, and early alerts for potential delays that the system recognizes before humans do, etc. I am overall very pleased with customer support and value for the cost of this tool, and I am excited to see this product go even further. Pros: I like the color coding, and simplicity of the platform. Thank goodness they changed their name, because saying their previous name was mind-blowing in a professional setting. Cons: Some of the capabilities are a bit out of the box, which in theory sounds good, but ultimately it meant we had to do work arounds for work arounds. There is not a section or ability to choose to see all of someone's tasks on a calendar or in order of due date. It simply shows "all" of someone's tasks, completed or not. Which meant we had to do digging through tasks or remove them when completed, even if that task was part of an overall campaign/pulse. I love the idea of this platform, and I wanted to love the simplicity of it as well, but using at as an agency just didn't make sense with having to find a work around for everything. Also, the mobile version is not as robust. I would expect to be able to do the same on mobile as on desktop with how simple the platform is. Overall: We were able to organize our tasks, but ultimately it did not do what we needed it to do overall. Pros: Monday.com has a nice, native client for my iPhone, and a decent website. It is easy to track "boards" and the interface is fresh and modern looking. Cons: I began using this product when it was still called "daPulse" and it felt like it was in beta at the time. It still feels like it's in beta. Features available on the web client do not match those on the mobile, native tool, and they are not inconsequential features. Their support staff, while delightfully polite, have a pretty-canned reply of "we know about that and hope to fix it in the future" to nearly every bug report. The lack of integration with other tracking tools makes like JIRA or TFS limits the usefulness of this tool, as everything has to be duplicated in it. Overall: Monday.com is an answer in search of a question. While it attempts to be a novel approach to task tracking, and it provides a nice summary view to be handed off to upper management, it lacks the sophistication of detailed tools dedicated to tracking. The (current as of this writing) inability to *copy* tasks from one spring (AKA "board") to another doesn't allow for history tracking. Tasks must be moved, or retyped in their entirety. Such a simplistic feature being absent makes this difficult to recommend, especially when combined with its lack of integration with other tools. Pros: Visually, Monday.com is appealing. It's color scheme makes it easy to quickly scan and view a project or task's status. It is also very easy to organize projects and tasks in various boards. Each task has the ability to add comments, files, docs, etc to keep everything in one place. Cons: There are some key features I always look for in a PM software that this one doesn't have: task dependency, able to quickly build timeline, easily describe who is accountable for which task. Right now, timeline building is very click heavy. It's OK if you are needing to manage few projects with few tasks, but by not having task dependencies or a user flow that makes it easier to get several dozen tasks added, it is very time extensive. Overall: Overall experience is good. If you're utilizing this software, you need to make sure that your team's adoption is fast and consistent. Otherwise, you'll find yourself being the only person using it and doing more micro-management. Pros: I wanted to love Monday.com-I'm a huge proponent of project management across many departments in an organization. Often IT seems to lead the charge here, but marketing and operations can also benefit from this type of software. BUT monday.com feels too much like a pretty, simplified version of Microsoft Project. I do like that you can create separate projects and tasks but setting everything up and inviting people to join is cumbersome. Cons: The software is not intuitive to someone without a project management background. Software like monday.com, Asana, Trello should be simple and easy for everyone to navigate and monday.com falls short on this point. While it has everything you need to organize complex projects that lack of ease for the everyday user makes it fail for my organization. 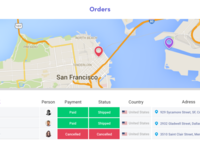 Pros: interface, friendly with the user, and the people in the back supporting the customer is great, friendly and replies fast. You can create your own boards, edit tags, upload files, tag your team keeps track of projects or things to do. They continue developing new things to make it easier to use and optimize tasks. Cons: It has a few bugs but the team tries to make it better everyday. It should be easier to search an archive pulse or file, when you want to un archive a file is a little confusing on how to do it and won't show immediately on the board. Pros: The layout and designs are beautiful. The tool looks very nice - the way it is presenting the charts and time sheets is just wonderful. They have a vary good marketing - it looks better than it works in my opinion. Cons: There is nothing outstanding about this tool. It is just like an excel (tables, charts etc.) but made in a beautiful manner. Most of the functionalities can be introduced into standard spreadsheet and used without of this pricey tool (looks cheap but in long run can be prices). We tested it but did not choose to use it as we did not find the added value. Pros: I like how projects are lined up with icons denoting who is responsible for various stages of the projects. Cons: The ability to add columns is nice, but the functionality becomes redundant after just a few columns. Pros: Probably one of the best UIs out there for a project management tool. Very modern and well laid out. The ability to easy collaborate with other team members, track dates & progress is definitely its strong point. 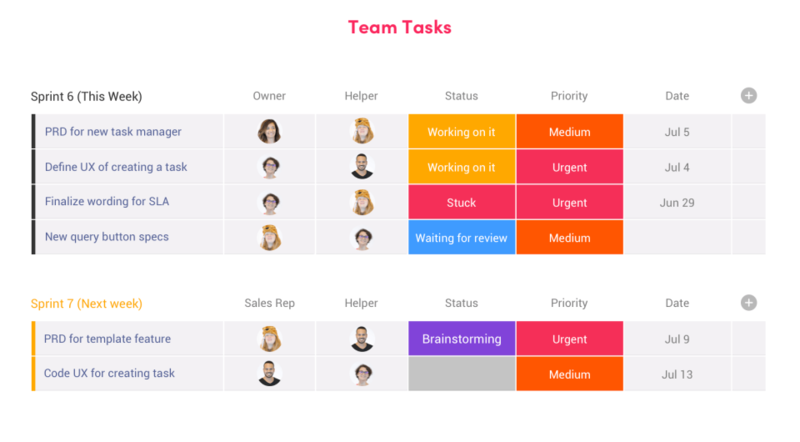 Cons: This is really a tool for teams - being a one man operation having to assign tasks to myself became a bit daunting. If your in a position where you're sharing and delegating tasks on a daily basis I can definitely see the fit, but not the best for solo operations. Pros: Its very flexible and can be used across the business for lots of different types of jobs. It's UI is also nice. Cons: Once you take the plunge and pay for your team, you start getting used to it and realise that they have restricted certain features if you're not paying for the next level up. Often, they are pretty basic features such as searching for pulses (the items of work) and if you're using it properly, you can have hundreds of them. You also can't see change logs that are more than a week old. These are gritty little things that are just plain annoying because they arent cheap in the first place and we only have a small team. One of our pulses is now to find an alternative! Pros: The features that Monday does well are great and being able to create a project list with custom fields (we had to upgrade further to use this functionality) and a timeline is very helpful. I found the tool easy enough to use and plan my team's projects. Cons: The main issue is with flexibility. 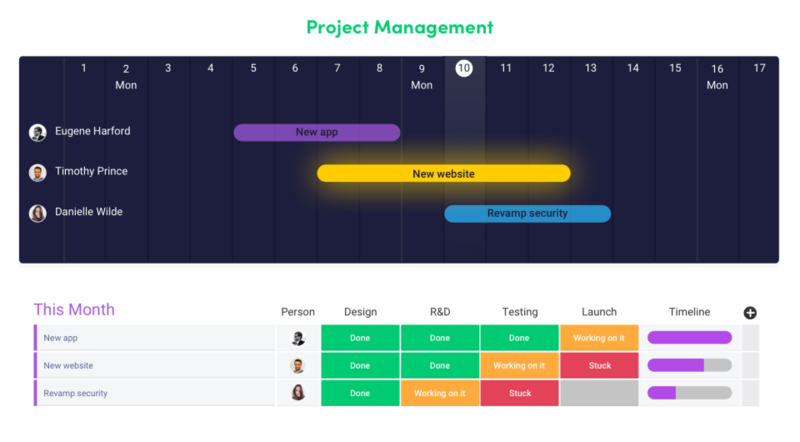 Monday has gone down a specific route of how they function and how you can create projects, which makes sense, but when you're working in a team you really need a tool that lets each person work in the way that suits them. That's why I ended up moving to Asana. I can't fault Monday's product other than it didn't work for everyone on my team. Pros: It's solid software that allows you to manage workflow pretty decently. Cons: "Dapulse" - I don't really like the name, but I digress. Monday.com is starting to become overloaded with features that it's starting to overwhelm me as a user. I used to enjoy using the product but it's so convoluted now that I don't know if it's trying to combine a bunch of different products I use into one - which is fine, but not at the risk of a good user experience. Pros: It looks like a clean, efficient tool and that appealed to me a lot while searching for a new tool that my volunteers would actually use. Cons: I contacted them about non-profit pricing and got an autoresponse. Then I got a human response that didn't even answer the basic question "do you offer non-profit pricing discounts?" and asked what other tools I've been using. I answered, and they said "great, I've got a consultant in mind to help you with that. They'll email you soon." The consultant emailed a while later (a day I think), and still didn't offer me any information, asking to set up a phone call to discuss my needs. My needs were already laid out in the previous thread and the initial question. All I wanted was a "yes, we offer discounts of X%" or "yes, we offer discounts that depend upon the services you request" but instead I got jerked around and they wanted more of my time before offering me any information whatsoever. Overall: None, as I never used it given the terrible customer service approach. Pros: Its a great idea in THEORY to have all your task and all that jazz centralized for all your employees, the visibility is nice, and that is what this does it make it nice and pretty for you, and if you are looking something to make your to do list super fancy than this is the software for you! another pro is you can try out a free trial. Pros: Monday has a catchy design and interface that is fun to use and easy to work with. Cons: The software is limited for my use. I needed the ability to better organize and tag projects and have them related to one another. This is more of a "flat file" style spreadsheet approach to projects. Overall: For small teams with straightforward deliverables and time lines, this is I'm sure a good product. Just not for my usage. Cons: Limited output on project progress - cross project updates. Overall: Beautiful interface, easy to use but not much more functionality than using excel. 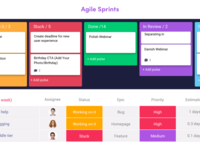 If you are looking for a project management tool capable of integrating functionality this is probably not the tool for you. We have cross platform products with intersecting projects and I have been finding it is very heavy on the data entry with very little output for project progress. Let's say we agree with you somehow: dapulse is like excel... on steroids! The idea is the same: a highly customisable and intuitive tool that helps you create any type of structure. dapulse's advantage and secret sauce would be its interactivity, ability to share and store files, and communication aspect. We also agree on the limitations -- we're not excel, and will never be. Thank you again for your review Laura! Pros: It's great to be able to map out tasks, assign items to team members and provide updates on tasks. Cons: Set up took a long time as it's not the most user friendly program. After the free trial ends it's too expensive for what it is. Pros: Great overall idea for start-up & established businesses. 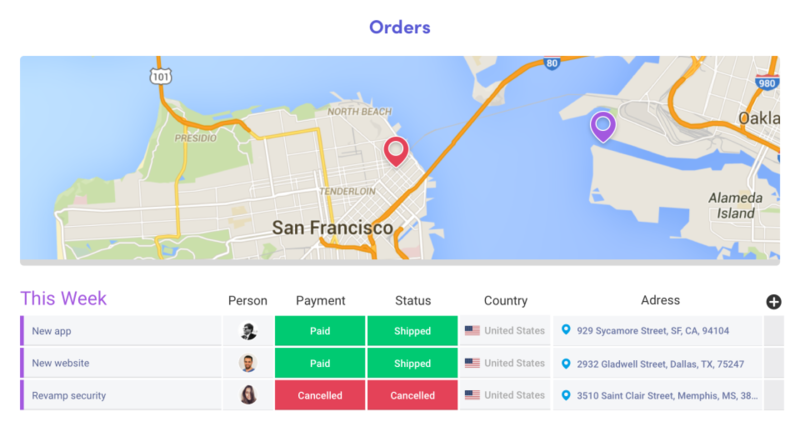 Organizing & managing sales & inventory all in one. An cool business communication tool. Cons: Paying for additional features that should have been included. Not really worth the monthly fee. Overall: It was ok but not an experience I would recommend to anyone under 2-3 employees like myself. It is a bit more time consuming than I expected, but not worth leaving a simpler for. Pros: We tried to implement this software at the last startup I worked for but it was a massive failure. Entering the projects you're working on is easy but then you have to also enter some arbitrary number of hours for tasks and before you know it you've assigned yourself 143 hours worth of tasks to tackle this week. Cons: Prioritizing isn't easy and all of this get visualized in Gantt charts which I find totally useless. When tasks don't get finished by the end of the week you just end up shifting them to the next week. We spent more time moving stuff around and setting it up than it was worth and the PM trying to manage things still just ended up chasing everyone like before. Overall: Meh - I would use Asana, Jira or Trello over this software any day. Pros: Monday.com is great for organization. My team uses ti to organize all the content we are producing. It helps track who is doing what and keeps my team accountable for their tasks. Cons: Monday.com is very glitchy particularly on my MacBook. Also, the mobile app is ok- would not say it's great. Overall: Good to have, not a MUST HAVE. Pros: Ease of use, the software is flexible! it helps a lot to organize a work team and track the information easily and also follow up. Cons: Sometimes it works slowly and is not a internet problem, maybe could be when the more than 4 team members are working on the app. Not too sure about it but could be! Cons: It was all over the place with the layout and the task classifications. Very hard for most people to get the hang of and use effectively. 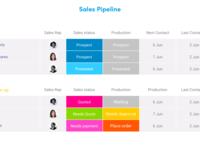 Pros: Functionality is impressive...think Gantt chart on steroids! Very helpful for basic project management work, setting goals for projects with timelines, keeping projects on-track. It was very user friendly and has a good support system if you run into problems. Cons: It isn't a replacement, however, for more robust project management systems like Basecamp or TeamWork. I would use depulse if all you wanted to do was produce a Gantt chart, but if you wanted a system that could handle a complex series of projects, then I would use a more robust system. 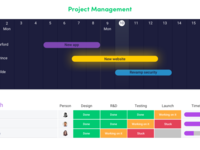 Overall: Great at enhanced Gantt chart generation with some project management features. Useful in visualizing projects, timelines, and progress on goals. Pros: Monday is very easy to use. When you first sign on as a first time user, you probably won't have problems figuring out how to navigate Monday.com. It's user friendly and the the features are easy to find. Cons: I felt that this product just didn't have enough features to be worth it to me. It was to basic, didn't distinguish its self enough from other platforms that we were using it for. I got a free trial and tested it for a month and didn't find enough features that were worth using for me. You can tag things as not started, started, and done, for example. But other software might let you keep notes on your OKR meetings or link related objectives and Monday doesn't allow these. Overall: We were using this software to manage OKRs. We didn't end up staying with monday.combecause of its limited number of features. Pros: Collaboration of tasks between my peers. Cons: any decent feature is at an additional charge. Columns are set for the entire page and not the grouped line items. And the names you call things I can't remember right now lol. Overall: It does allow management to actually see the amount of work I do daily. Hi David! Thank you so much for this great feedback! We are making quite changes in our way of working, you'll feel the difference soon, we're sure! Cons: Limited features. Would like more / better functionality around calendar views and blocking / nested tasks. Cons: too many choices on how to set up. Can't permanently sort by due dates. No automatic "hide" or archiving for completed tasks. Overall: After a month with this tool, I'm optimistic that it'll help us stay on top of things. Cons: User interface is less intuitive and email updates on boards become unnecessary in many cases. Team dropped use without buy-in. Pros: Ease of communication for all parties in a group; ease of creating and tracking project milestones across a wide variety of projects. Cons: Use of the word "Pulse". It's weird, just stop it already. But the software is great. Comments: Pros: Beautiful, responsive interface. Simple, easy to use. Excellent tutorial and onboarding. Light collaboration and scheduling tools. Cons: Weak project and task management tools. Incomplete Android support. Expensive. Regarding your cons, we'd love to have a call with you to discuss your set up and see if we could give you some tips to get the most value out of the tool. Pros: I love it! I would choose this over basecamp any day of the week. The visual aspect is better for us visual people. Pros: It was pretty easy to get setup and structured. Cons: It just felt clumsy and confusing as I had more and more projects built into it. I switched to Asana after this project.